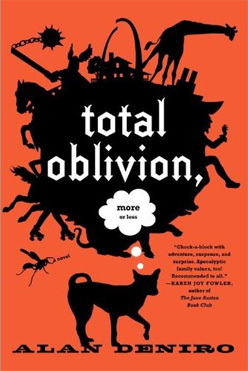 If you didn’t already know, Alan DeNiro’s first novel, Total Oblivion, More or Less, is now out, and you should be reading it, cause it is fantastic. And while you’re at it, if you missed his short story collection, Skinny Dipping in the Lake of the Dead, from a few years back, you should take the time to get it, too. You will not be sorry, only amazed. The Nebula Award nomination period is now open! The rules have changed a lot this year, and I’m excited to see how those changes are reflected in the preliminary and final ballots. Alas, I’ve read almost nothing but books assigned for my MFA degree and my own students’ stories in the last year, and am woefully behind on many of the current sf releases, wondering now to vote. So I’m calling on all of you (whoever’s out there reading this somewhat neglect blog) to please recommend your favorite short stories, novelettes, novellas, novels, sf films, and spec fic YA novels. It would be a great help to have somewhere to start, based on good recommendations. In the novelette category, my story “The Ghost Hunter’s Beautiful Daughter” which appeared in this month’s Asimov’s issue. In the novel category, my novel The Love We Share Without Knowing, which came out at the tail end of 2008 (which makes it a valid work for which to cast a vote). Two really well done reviews of the new volume of Interfictions are out. If anyone else feels like we’re still drowning in slipstream—or, rather, drowning in definitions of slipstream—this follow-up to the 2007 anthology Interfictions certainly won’t offer any easy answers to the question of what’s been going on lately with all this genre-bending stuff. What Interfictions 2 does offer is a set of stories that, if united by only the most tenuous thematic and generic threads, couldn’t be more worth reading. Indeed, the folks at Small Beer Press and the Interstitial Arts Foundation have once again produced an enormously rich anthology that takes an almost manic diversity for its guiding principle, not so much in order to provide something for everyone, but seemingly to include something from just about everywhere. Read the whole review, which is long and very detailed, and thus cool), by clicking here. Great to see readers responding to the book so quickly. Keep ’em coming! (AP) Several squirrels are barking at each other outside my upstairs window like military personnel. If any of them turns out to be the jerk who was living in my attic a year and a half ago or so, and if he’s planning to launch a new attack, there will be war. I hereby repeal my obviously premature congratulations to the state of Maine, which I gave out all too naively this past May. Now, instead, I’d like to say good luck to those Mainers who want a better, inclusive, love-supporting culture in which to exist for their and their children’s futures. I feel sorry for everyone, even for those who voted in the spirit of exclusion and inequality. I really do think they don’t understand what they are missing. They see their decisions as a protection and defense, but all they are defending are walls that separate people, rather than unify. When they’re able to coexist in a mature manner with people who are unlike them, perhaps then Maine will be ready to be a better place, and a better people as a whole. It’s not really Maine specifically, though, and I’m disturbed by all of the Twitterers and Facebookers and other online social groupers who are taking their disappointment and disgust out on Maine alone. This is really how the majority of the United States still feels on the subject. There is still a lot of work to be done. And even if all of the U.S. acknowledged the rights of gay people to marry, there would still be problems with the culture’s general destructive nature towards LGBT people. After all, look at what’s occurring in Merry Olde England, where gay marriage is legal. Changing the law is one thing. Changing a culture is another. Of course changing the law is the beginning of something. But it’s the first step on a long road to come. The second volume of Interfictions releases today, and just tonight I learned that the anthology has been selected by Amazon.com as one of the top 10 SFF books of 2009! You can see the whole list by clicking here. I can’t wait to hear what readers think of the selection of stories Delia and I pulled together. I think the book has great range. Happy reading, if you give it a go.